Luke Walton believes the addition of Tyson Chandler will have a major impact on the Los Angeles Lakers. 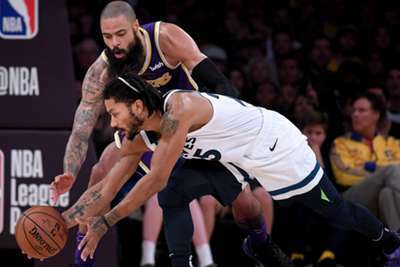 The 36-year-old center, who signed with the Lakers this week after he was bought out by the Phoenix Suns, grabbed a pair of key offensive rebounds in the fourth quarter of his team debut against the Minnesota Timberwolves on Wednesday. Chandler finished with nine rebounds in 23 minutes in the Lakers' 114-110 win. Walton, the third-year Lakers coach, discussed Chandler's effect on the team after the game. "We needed the help now," Walton said (via ESPN). "And I don't know how that all works but give [general manager] Rob [Pelinka] and Magic [Johnson] credit for recognising that and going out and getting that job done for our squad." The Lakers did not have a true backup center on their roster before they added Chandler and their defense struggled when starter JaVale McGee headed to the bench. Walton thinks that will now be less of an issue. "I think it helps stabilise us," he said. "I think it will help make us more of the consistent type of team we want to be defensively and rebounding." The win over Minnesota moved the Lakers to 5-6 this season.